Today I got a chance to do a little bit of geocaching, I have been sitting at 199 finds for a little while now, I was kid of hoping to make my 200th find a little more interesting. Better for it to have a good story, at least I thought so. I decided to go after a cache called Annie's Friend. It is a virtual cache, which means that there is no log book, in this case you get to the general area, then have to locate a certain plaque. To count the cache as a find you must send the creator of the cache an e-mail with three names of individuals that are on the plaque. The reason that I chose this particular cache was because of the location. It isn't just some random location, it is actually on the walkwawy to Buffalo Bill Cody's Grave on Lookout Mountain. If you don't know where that is, it is just weat of Denver. Many people that have driven through the area will have seen the big letter "M" that the Colorado School of Mines has near the top of the mountain. At right is a photo I took last year from near the cache, as you can see it has an excellent view of the denver area. I hadn't been to Buffalo Bill Cody's grave and memorial in many, many years. It was something that my parents took me to when I was a kid. If you haven't been, I would suggest you check it out. There is a gift shop and small museum there as well, plus there are a few nature hikes that start from the parking lot. If you are looking for more geocaching in the area, there are several caches along the road from Golden to the Buffalo Bill Museum. Stop and log some caches while you enjoy the view. You won't regret it. 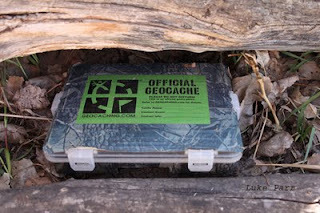 Now that I have found 200 geocaches, I am looking forward to the next 200. Did you reach a milestone recently, or have you hand picked a geocache for a certain time? Let me know in the comment section below. This is a continuation of my posts on using lead core fishing line. Lead core fishing line allows the angler to get his lure deeper into the water without the use of heavy weights, downriggers or other specialty equipment, such as dipsy divers. With a fishing rod and reel set up with lead core line you can get your lure or bait down to where you want it, then just reel the fish in without having to worry about the weights or lines getting in the way of fighting the fish. If you haven't already read my first two posts, check them out here: Fishing with lead core line, What is It? and Getting Set Up. Hopefully you have read the previous two posts and are ready to start fishing. 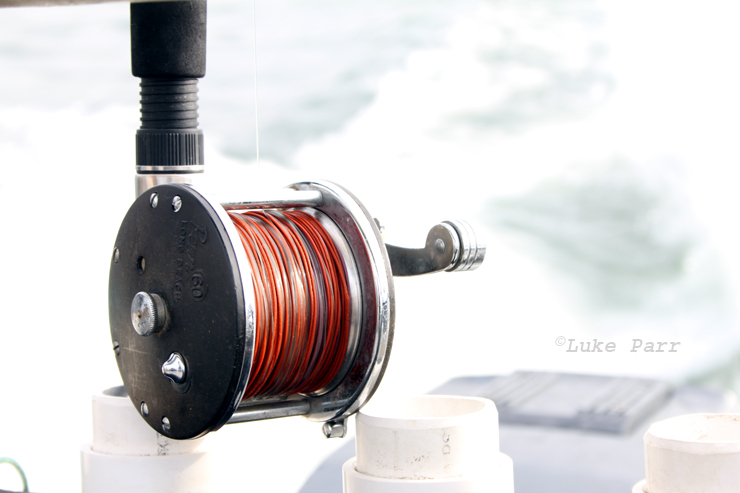 Assuming you are ready to hit the water on your boat, let's talk about how to use the lead core line. In general, your lead core line is going to sink about five feet per color that you let out. This will vary depending on how fast your boat is moving and how heavy your lure is. The faster you are going, or the lighter the lure, the less depth you will get. On the other hand, if you are moving slowly, or using a heavy lure, you will get your lure down deeper. While using the lead core, especially when you are fishing your lure near the bottom structure, pay special attention to how much line you have out, as well as your speed and how the boat is moving. You may be moving fast enough to keep the line where you want it, but if you make a turn, any line on the outside of the turn will move through the water faster. Conversely, any line that you have out on the inside of the turn will slow down. This means that a lure that is traveling just over the bottom structure may drag or snag if you turn too sharply. 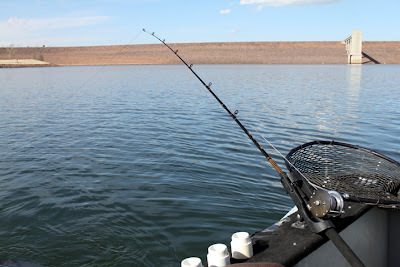 To keep the lure from dragging you will have to make very wide turns, or pull in some line. Another trick that I use some times is to speed up a little when I want to make a tight turn, that way the lures rise up a little in the water column as I turn. I generally use the five foot per color estimate, but if you really want to know how deep you are going, use the following trick: Traveling at the speed you want to troll and using the lure you want to use, let out line until your lure starts bouncing off the bottom. When you do this in an area where you know the bottom depth, you will be able to figure out how much line you let out to hit the bottom. Obviously this works better with a relatively constant bottom depth and where there is as little as possible to snag on. Now that you know how deep your line is going, you need to decide where you want to troll and how much line to let out. If you are already familiar with the lake and know what you want to do, go for it. Otherwise you will need to start getting an idea of how to fish a particular lake. If you can, buy a map for the lake ahead of time. A good map with under water topography will let you see the depth of various parts of the lake and will show fingers, valleys and points that are underwater. Using the map you will gain an idea of the depth of a certain part of the lake and will be able to see where you need to go to keep your boat over a constant depth. This is a great time to use your fish finder. Your fish finder will not only show you were the fish are, but it will also give you information about how deep the water is and what the bottom looks like. You will be able to see if the bottom depth is constant, or moving. You will also be able to see if the bottom is smooth, or if there are rocks or other structure. Now that you know how to get to the right depth, now it's time to take it out on the water. For example, we will use a dam face. Typically a dam will have a fairly constant shape to it as it slopes down into the water. Let's say you are 100 feet away from the dam and the water depth is 20 feet, if you troll along the dam and keep your distance at an average distance of 100 feet, you will most likely stay in about 20 feet of water. Now with your fish finder, you can see that there are fish suspended at about 15-18 feet below the surface. Using our average of five feet per color, you would let out about three colors to get your line down to about 15 feet. This will put you right at, or just above the majority of the fish. Now you can troll along the dam face and know that your line should be far enough above the lake bottom to avoid snags, but close enough to the fish that you will hopefully start getting bites. Dodgers can help attract fish to your lure. If you pass through the fish and none of the fish take the bait, keep trying. 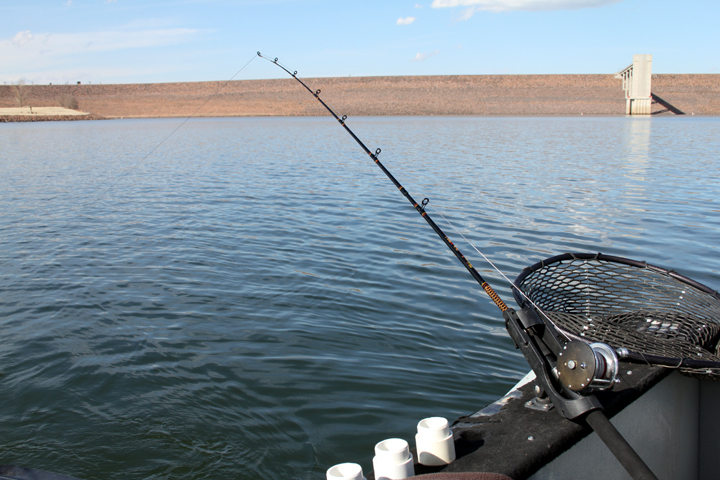 Switch your lures and go back through the area that had fish. Frequently it comes down to getting the right bait in front of the fish at the right time. So don't give up when you know that the fish are there, keep switching it up until you get bite. You can use a similar method almost anywhere in the lake. While fishing at Taylor Park Reservoir I was able to use the fish finder to locate a school of fish suspended 25-30 feet. They were suspended over the old river bed, with a total depth between 40-60 feet. I let out about five colors and everytime I went through the school I got a bite. I wasn't able to bring every one to the boat, but it was exciting hooking a fish each time we went through that spot. Without a fish finder to locate the fish and a way to get the lure down to the fish, we would have missed every one of those. Hopefully you can use this series of posts to get your own lead core line set up and start catching fish! Good luck and let me know how it goes in the comment section below. 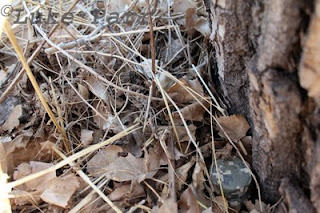 With my last post about geocaching with my son, I have reached 500 views to my blog. Thanks to all of you that have been coming to check it out, especially those of you that come back to see what is new. I have been enjoying writing online, so far I haven't received many comments. Please feel free to let me know your thoughts on any of the posts, or give some suggestions or requests for future posts. If you want to give some suggestions or requests contact me at adventurecolorado-at-gmail.com Just replace the "-at-" with @. Once again, thank you for reading and keep stopping by as I add more content. Today I had to pick up my son from school, but had several hours before I had to go into work. I decided that since it would just be the two of us, we might as well do some geocaching. 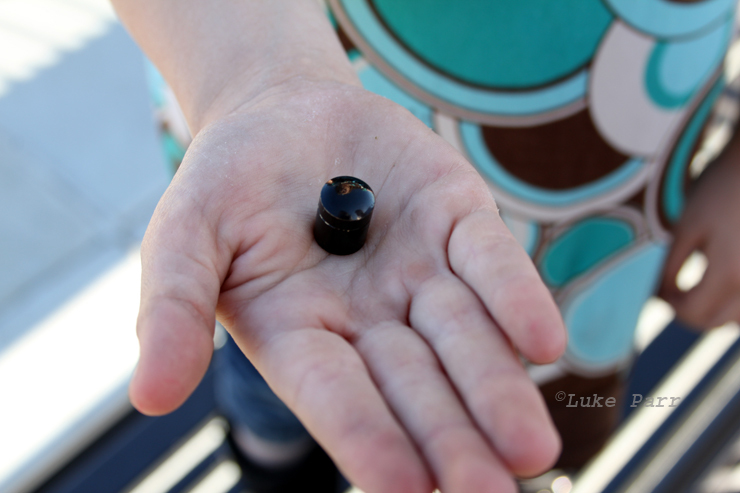 ﻿Geocaching with kids can be a lot of fun, to them it is like a treasure hunt. My son loved the idea of looking for some caches after school. We ran home and cooked up a pizza to fuel our hunting. Once it was done, we set off with eight geocaches loaded into the GPSr to find. If you want any tips on geocaching with kids, check out my previous blog post here. Since we didn't have a lot of time, all of the caches we were looking for would be located around the city. Some where in nearby parks, several of them were right in parking lots. The picture below depicts a fairly common parking lot type cache. 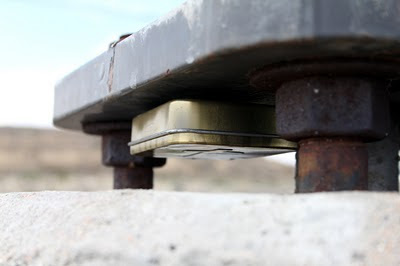 A typical "skirt lift" geocache. Several of the days caches were on or near light posts, as this one was. 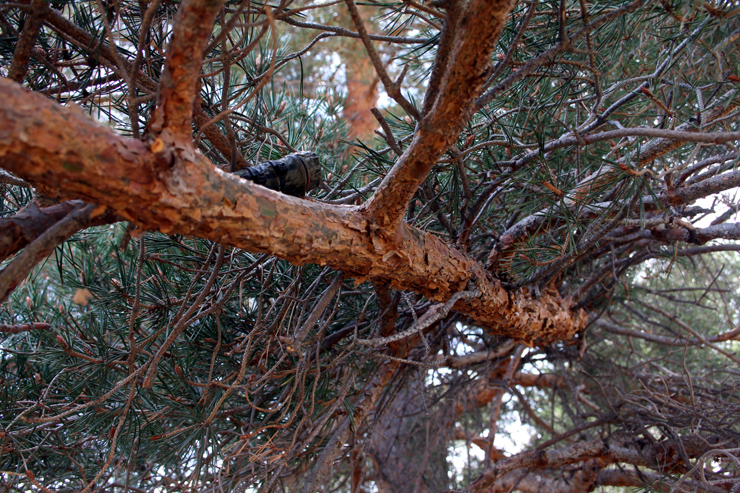 ﻿But, with plenty of parks located around where we live, there were also a couple caches hidden in or around trees. 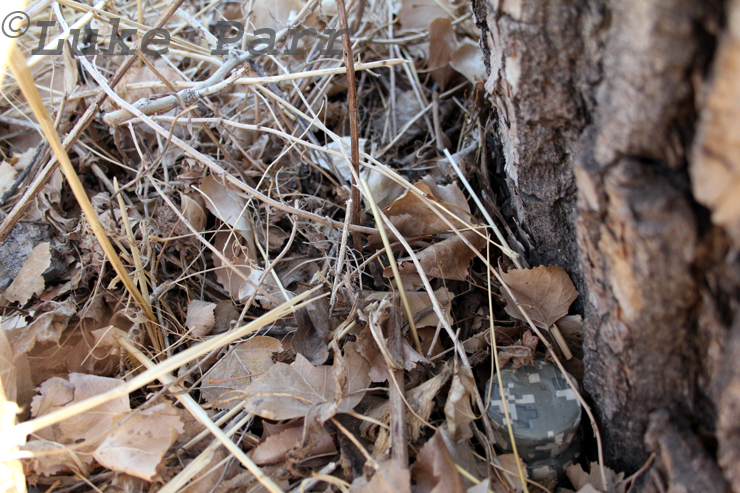 These can be challenging, there are a surprising number of ways that a cache can be hidden around or in a tree. It all depends on the size of the cache and how hard the person wanted to hide it. This was one that took us a few minutes, but wasn't too difficult, can you find the cache in the picture below? Can you spot this geocache? 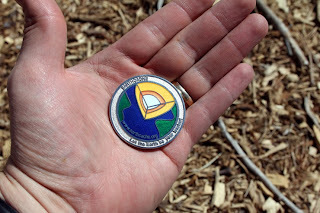 A Geocoin displaying the "Earth Cache" symbol. One of my favorite parts about geocaching, is find the trackable items. ﻿These are often referred to as Travel Bugs, or Geocoins. They have a unique code on them that corresponds to a web page on the http://www.geocaching.com/ website. The code and the web page allow you to log where you found the coin and what geocache you put the coin in later. I had a Geocoin from before and while we were out we found this earth Geocoin, pictured to the right. We left the Geocoin we had and picked this one up to take to a new cache. Ideally you take the new coin as far as possible before placing it. Always check the web page for the coin to see if it has any specific directions or locations that the owner wants it to visit. If the want it to go from New York to California, you should probably try to move west, rather than east. Overall we both had a lot of fun, one of the geocaches eluded us, so we will be coming back for that one later. But any day that I can spend outside with my son is a good day. A couple posts ago I spoke about taking our new (to us) pontoon boat out on Chatfield Reservoir. We had a great time with the kids and caught a few Rainbow Trout, which we may try to smoke, now that we have a little experience smoking salmon. I thought I would take this time to post some info on Chatfield, this will be my first lake profile post. When you go fishing, do you keep everything you catch so you can fry it up for dinner? Do you throw every fish back into the water to be caught another day? Or maybe, you are somewhere in the middle. Catch and release can be a controversial topic among anglers. I tend to fall in the middle ground, I will keep a few fish to eat, as evidence by my Smoked Salmon recipe, but I will typically throw some back to make sure that the next person has something to catch. I wrote a more in depth article about the topic over at Hubpages, check it out here if you're interested.